Despite the duo instrumentation, a diverse musical variety is successfully achieved. One More Cup of Coffee contains 11 tracks, ten of which are listed and credited. Of these ten, eight are originals, presented alongside Kosi’s interpretations of Charles Mingus’ “Goodbye Pork Pie Hat” and Vernon Duke’s standard “Autumn in New York.” As a songwriter, Kosi embodies funk, soul, jazz, and other influences into her music. Kosi’s voice is powerful, firmly rooted in jazz, drawing heavily on the blues, and especially well suited to the solo voice with guitar context. Marchak’s command of the guitar is impressive: his use of walking bass lines, arpeggiated and comped chords, and melodic runs constitute a rich orchestration from a single instrument. Each track has abundant space for extended improvisations from both Kosi and Marchak. “Little Miss Generous” is one of Kosi’s originals, a powerful minor 6/8 tune, with lyrics reflecting on selfless desperation. Kosi’s phrasing capability is most apparent in the 5/4 time signature of “The Coldest Summer.” The lyrics fit in an unexpected, yet seemingly inevitable, way. In other words, it works. “Marlene” features Kosi’s flamenco-influenced guitar playing on a steel string acoustic guitar, providing a timbral contrast with the rest of the album. Vocally, Kosi is at her rangiest on this tune. The vocals range from orations in the bottom of her range, to belting at the higher end, with everything including sobs, weeps, and growls in between. “Once and Future” is the last titled track on the album, and nicely sums up everything heard to this point. Lyrics, vocals, and guitar accompaniment come together nicely on this straight ahead jazz original. 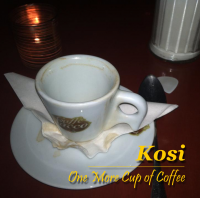 One More Cup of Coffee is a successful, self-produced offering from Kosi. The songwriting and arrangements are tasteful and fresh, the performance is excellent, and her originality shines throughout.